Remember this ridiculously cool skirt I drafted under the guidance of the very awesome Alison Smith of the School of Sewing? Well, she's just released her 2016 workshop dates and has also launched her own pattern range called Sew Wardrobe! Pretty exciting stuff, eh? Sew Wardrobe patterns are contemporary with classic, fitted lines, ideal for building up a capsule wardrobe...unless like me, you're attracted to all the colours and all the prints ;o) As well as the individual patterns, Alison also offers kits, so she kindly sent me a Clara Blouse kit to try out! The kit came with the pattern (obviously), beautiful cotton lawn, notions (thread and buttons), a sew-in label and the most wonderful interfacing ever! Doesn't good quality interfacing make such a difference? It would have cost me £25 to buy, which I think is a bargain considering the quality of the contents and the fact that the pattern alone would have been £14. 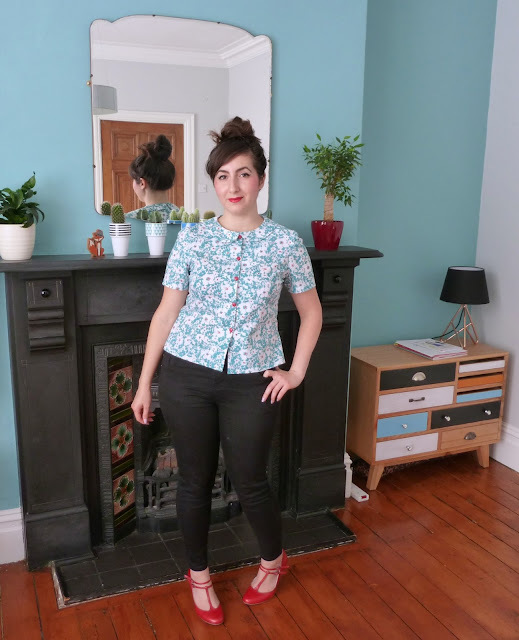 So, what can you expect from a Sew Wardrobe pattern? First off, the Clara Blouse is beautifully drafted and you'd expect nothing less from Alison given her expert background. The design is minimum fuss, yet has enough detail to keep things interesting and enough shaping to keep things elegant. On the other hand, the instructions are pretty basic compared to many other indie designers out there, but then again, Alison's patterns don't claim to 'cater' for beginners. Fear not though, for redemption comes in the form of online instructions accompanied by detailed photographs. Phew! Isn't the little collar cute as hell? Before we get distracted though, let's talk sizing. 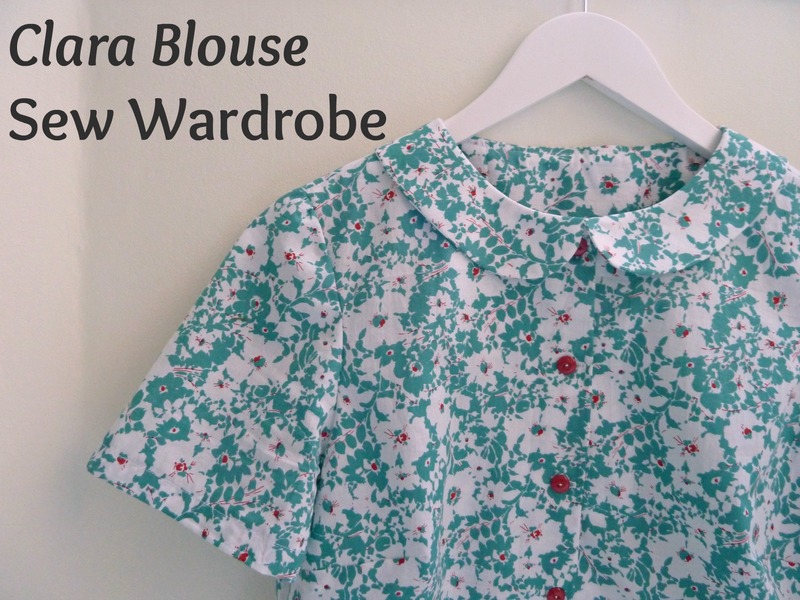 Sew Wardrobe patterns are currently only available in sizes 10 - 18 and they are based on high street sizing with very little ease. Luckily, Alison forewarned me about the lack of ease, so having gained some weight recently I opted for a size 14. Boy am I glad I didn't go smaller! I ended up cutting 12cm off the hem because it was a little too snug across my bum and muffin tops, which is a shame as I like a longer blouse. I could probably also do with a bit more room around the bust. Overall though I'm pretty pleased with this sweet blouse and my small fitting issues could have easily been resolved by making a muslin! Oh, do you like my red buttons? I swapped them out for the clear ones that came with the kit and I love how they pop against the turquoise whilst accentuating red flecks in the fabric! By the way, if you can't make it to Alison's excellent workshops, you can find her on Craftsy at your own convenience! Such a cute blouse. I will have to check these patterns out. I have her book "Dressmaking" which is excellent. Yes, do check them out...as you already know, Alison is one talented lady! What a cute shirt! I love the style of it and the colors. Nice work! Oh I love this blouse, it's just so cute. I've added the pattern to my very long wish list and my mind is running overtime thinking about different fabrics and detailing that can be used with it to create different looks. Oooh, hope you get around to making it soon Cate! Love it! The colors and the shape, and how lovely the red buttons look. I think I need to copy you, if you don't mind, I think this cute blouse will be perfect match for my red circle skirt. Really nice blouse! Love the fabric you've chosen (matches your walls LOL! ), and the design of the blouse really suits you. I too love the red buttons! lovely. that colour combo is great! i have a piece of fabric with similar colours so you might just have bumped it up the sewing queue!